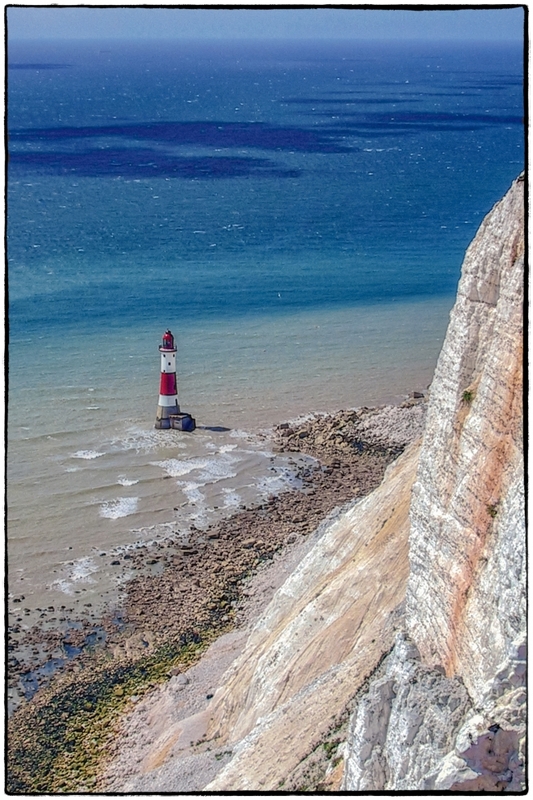 Taken during a trip to the United Kingdom in 2004, this is, with it’s distinctive read and white stripes, the well-known Beachy Head Lighthouse near Eastbourne in East Sussex. In 1900 to 1902 under the direction of Sir Thomas Matthews, the Trinity House Engineer-in-Chief, the lighthouse was built, sited about 165 metres seawards from the base of the cliffs. For the construction, a temporary cable car from the cliff has been installed for the transport of workers and stones to an iron ocean platform adjacent to the lighthouse. 3,660 tons of Cornish granite were used in the construction of the tower. In June 2010, Trinity House announced in the five yearly “Aids To Navigation Review” that the light range would be reduced to 8 nmi (15 km; 9.2 mi) and the fog signal discontinued. In February 2011, the work was undertaken and light range reduced by the installation of a new LED navigation light system. The old lens, though no longer in use, was left in situ. The fog signal was also discontinued at this time. The picture was taken with my second digital camera: A 2.1 megapixel Canon Powershot S-10. I remember being quite impressed with it at the time. I printed it 8×10 and was surprised at how good it looked. This entry was posted in Buildings/Structures, Landscapes, Places. Bookmark the permalink.